Angler Fish...The deep-sea Angler Fish is quite possibly the ugliest animal on the planet, & lives in what is easily the most inhospitable habitat: the lonely, light-less bottom of the sea. The angler fish is a culinary specialty in certain Asian countries. In Japan the angler fish sells for as much as U.S.$150.00, the angler fish liver alone being a great delicacy, can cost U.S.$100.00. 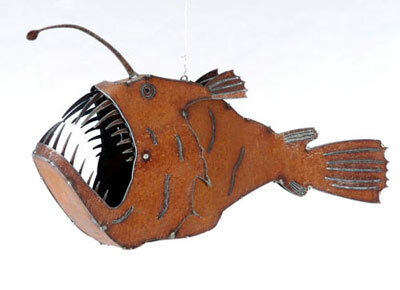 Henry Dupere Angler Fish Garden Sculpture. 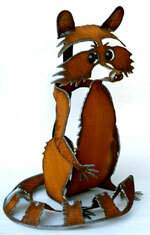 Size: 27" long x 15" tall. Three-dimensional rusted metal Angler Fish garden sculpture.